THESE TOP-OF-THE-LINE SHEDS ARE DRESSED TO IMPRESS. The Premier shed is our tallest shed offered! With standard high walls over seven and a half feet, and a 7/12 roof pitch, the overall height of this beauty is nearly 14 feet. With vinyl or lap siding, thermal radiant barrier, windows with transom glass above, and fiberglass doors as a few of the standard features, these sheds feature many bells and whistles. Add a garage package, transom dormer and transom glass as pictured in the photo gallery to get the backyard building of your dreams. 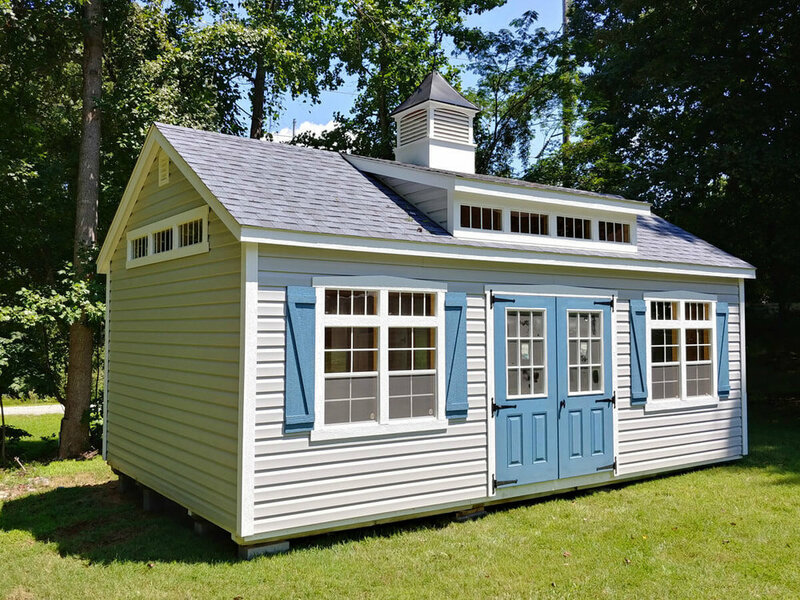 The Premier Vinyl Shed features two sets of dramatic windows, each with two 24x36 windows, transom glass above the windows. large z-shutters and dramatic window trim. These types of finishing touches take the Premier to the next level. With the vinyl option, the siding is vinyl and finished with wood trim, eaves and accents. Shown with Transom Dormer, extra Painted Door, and Transom Glass. Why Choose A Premier Shed? If you want to “Go Big And Take It Home” then you’re ready for a Premier! With its high walls and high roof pitch, the Premier adds a stunning look to your landscape. A popular choice is to add a garage package to a Premier shed to create your dream garage or workshop. The Premier gives you the extra space, with exceptional style, to truly live the lifestyle you have wanted. If you’re looking to build a tiny home, consider working with your contractor to use a Premier as the starter shell. Design A Shed For Your Life! Maximize its usefulness by adding one of our custom packages to create a garage, home office, backyard retreat, man-cave, she-shed, art studio, or sports center of your dreams! Please note that 14’ wide sheds are measured wall to wall, while 12’ wide sheds are measured across eaves due to NC DOT regulations.